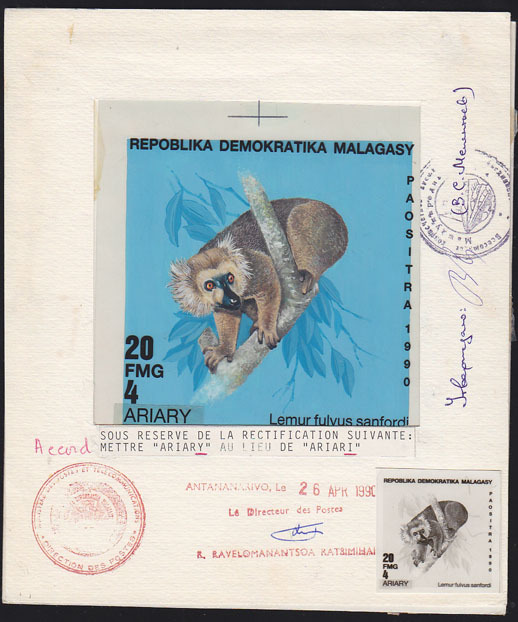 52 MAQ MADAGASCAR (1990) Eastern wooly lemur (Avahi laniger)*. Original artwork, watercolor on posterboard (17 x 20 cm) with acetate overlay for lettering. Handstamp, signature and approval of Director of Posts accompanied by monochrome proof of stamp. Design in window measures 11 x 11 cm. Scott No 987, Yvert No 978. Unique! 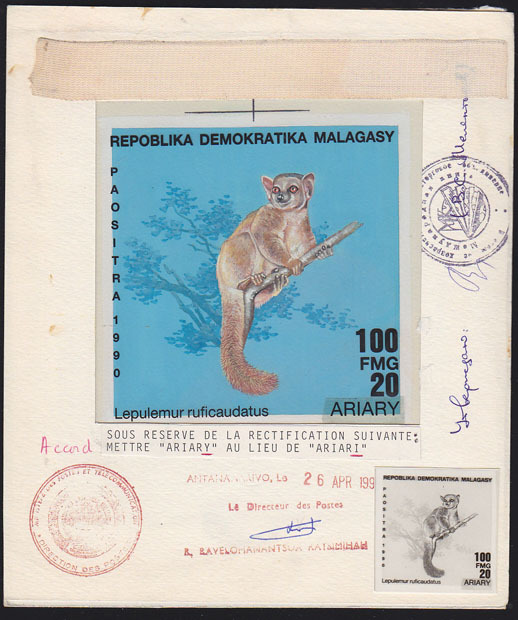 53 MAQ MADAGASCAR (1990) Sanford's lemur (Lemur fulvus sanfordi)*. Original artwork, watercolor on posterboard (17 x 20 cm) with acetate overlay for lettering. Handstamp, signature and approval of Director of Posts accompanied by monochrome proof of stamp. Design in window measures 11 x 11 cm. Scott No 988, Yvert No 979. Unique! 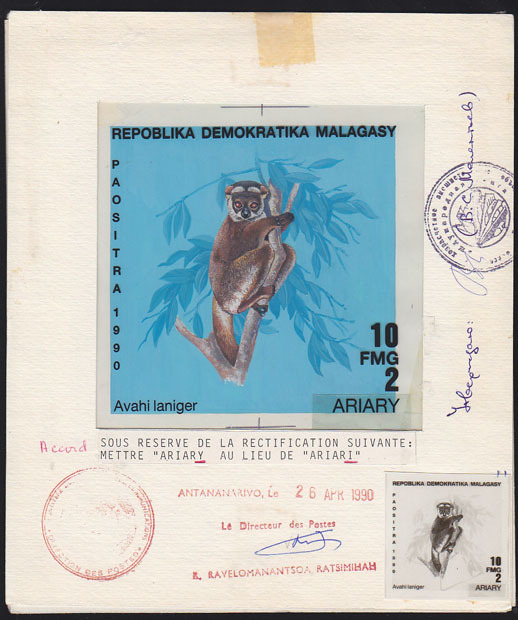 54 MAQ MADAGASCAR (1990) White-headed lemur (Lemur fulvus albifrons)*. Original artwork, watercolor on posterboard (17 x 20 cm) with acetate overlay for lettering. Handstamp, signature and approval of Director of Posts accompanied by monochrome proof of stamp. Design in window measures 11 x 11 cm. Scott No 989, Yvert No 980. Unique! 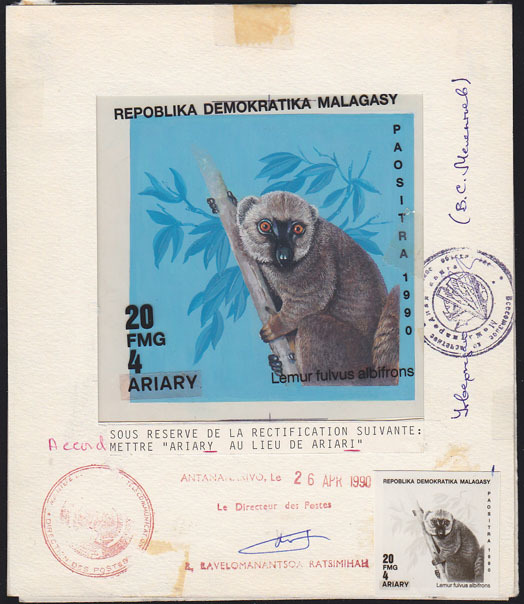 56 MAQ MADAGASCAR (1990) Common brown lemur (Lemur rufocaudalis)*. Original artwork, watercolor on posterboard (17 x 20 cm) with acetate overlay for lettering. 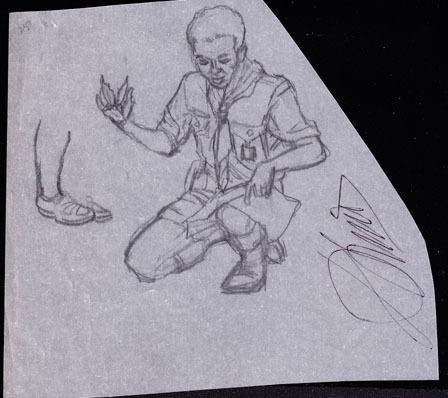 Handstamp, signature and approval of Director of Posts accompanied by monochrome proof of stamp. Design in window measures 11 x 11 cm. Scott No 990, Yvert No 981. Unique! 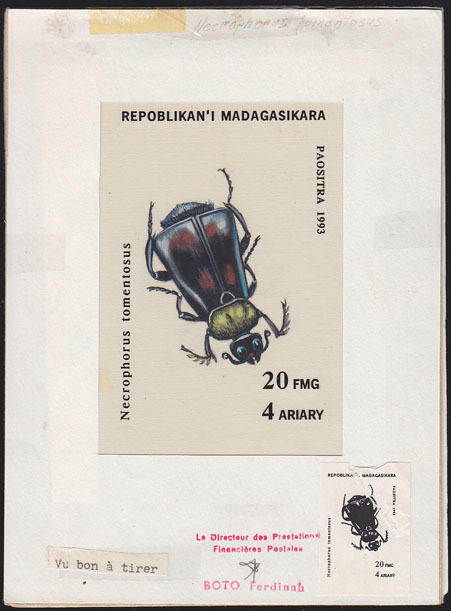 1538 MAQ MADAGASCAR (1994) Gold-necked carrion beetle (Nicrophorus tomentosus)*. Original artwork, watercolor on posterboard (15 x 20 cm) with acetate overlay for lettering. 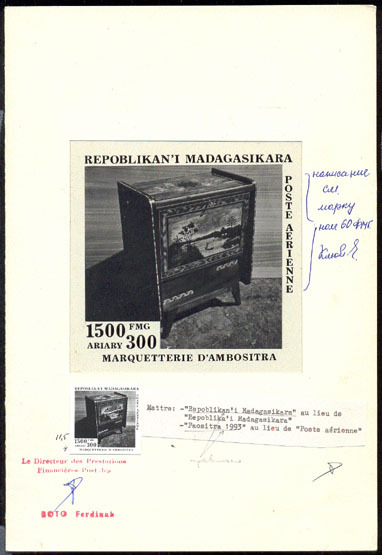 Approval signature of Director of Posts accompanied by monochrome proof of stamp. Design in window measures 8 x 12 cm. Scott No 1216, Yvert No 1323H. Unique! 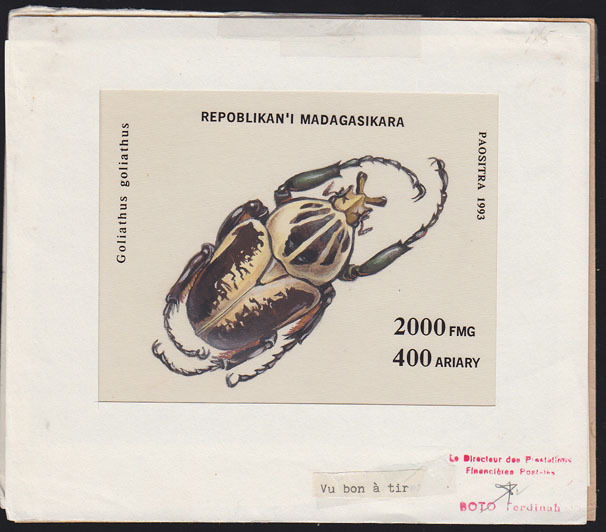 1539 MAQ MADAGASCAR (1994) Eastern Hercules Beetle. (Dynastes tityus)*. Original artwork, watercolor on posterboard (15 x 20 cm) with acetate overlay for lettering. Approval signature of Director of Posts accompanied by monochrome proof of stamp. Design in window measures 8 x 12 cm. Scott No 1217, Yvert No 1323J. Unique! 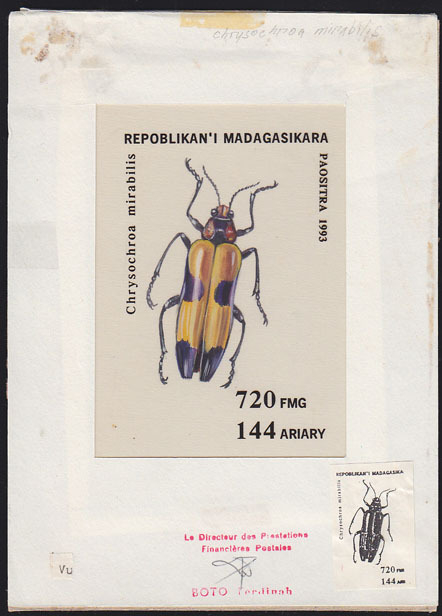 1540 MAQ MADAGASCAR (1994) Megaloxantha bicolor*. Original artwork, watercolor on posterboard (15 x 20 cm) with acetate overlay for lettering. Approval signature of Director of Posts accompanied by monochrome proof of stamp. Design in window measures 8 x 12 cm. Scott No 1218, Yvert No 1323K. Unique! 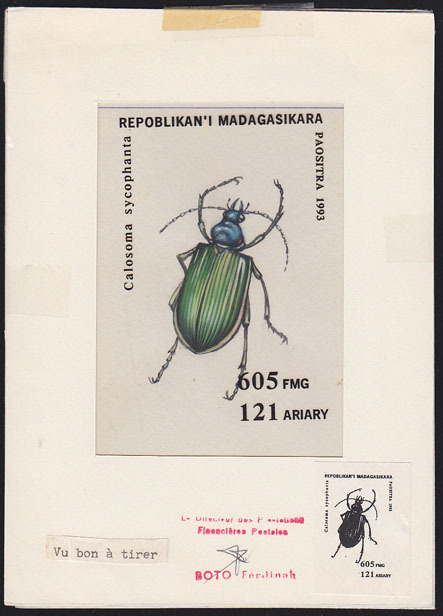 1541 MAQ MADAGASCAR (1994) Forest caterpillar hunter (Calosoma sycophanta )*. Original artwork, watercolor on posterboard (15 x 20 cm) with acetate overlay for lettering. 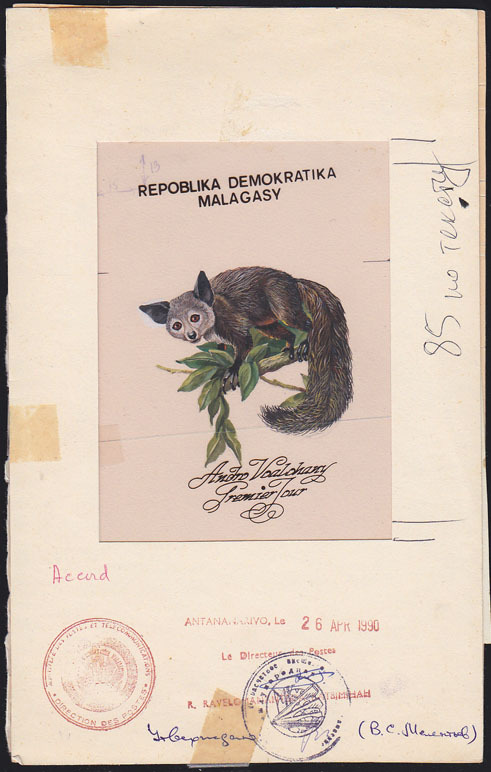 Approval signature of Director of Posts accompanied by monochrome proof of stamp. Design in window measures 8 x 12 cm. Scott No 1219, Yvert No 1323L. Unique! 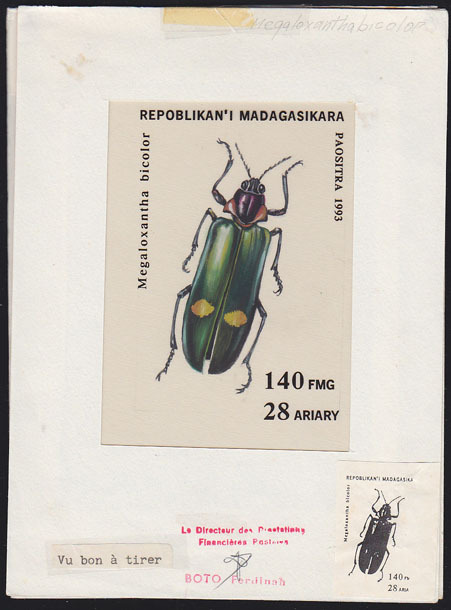 1542 MAQ MADAGASCAR (1994) Chrysochroa mirabilis*. Original artwork, watercolor on posterboard (15 x 20 cm) with acetate overlay for lettering. Approval signature of Director of Posts accompanied by monochrome proof of stamp. Design in window measures 8 x 12 cm. Scott No 1221, Yvert No 1323M. Unique! 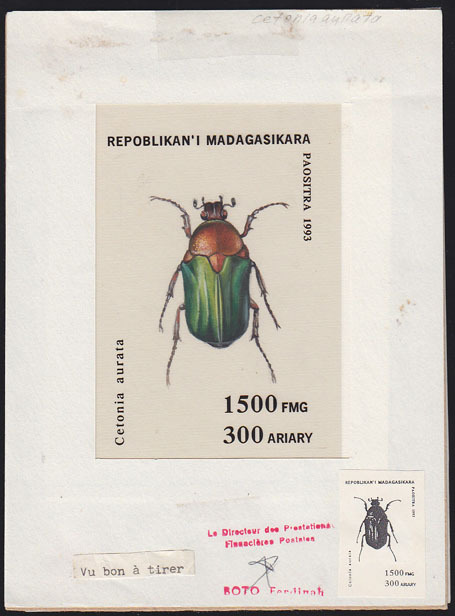 1543 MAQ MADAGASCAR (1994) Green rose chafer (Cetonia aurata)*. Original artwork, watercolor on posterboard (15 x 20 cm) with acetate overlay for lettering. Approval signature of Director of Posts accompanied by monochrome proof of stamp. 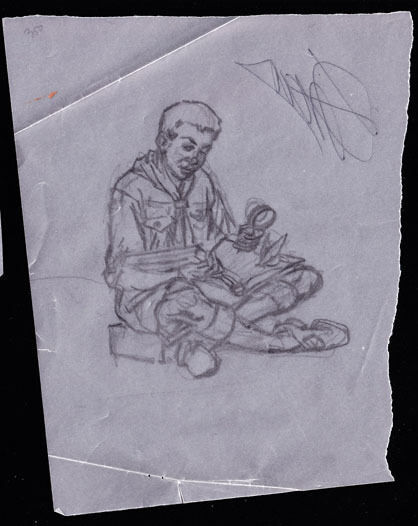 Design in window measures 8 x 12 cm. Scott No 1222, Yvert No 1323P. Unique! 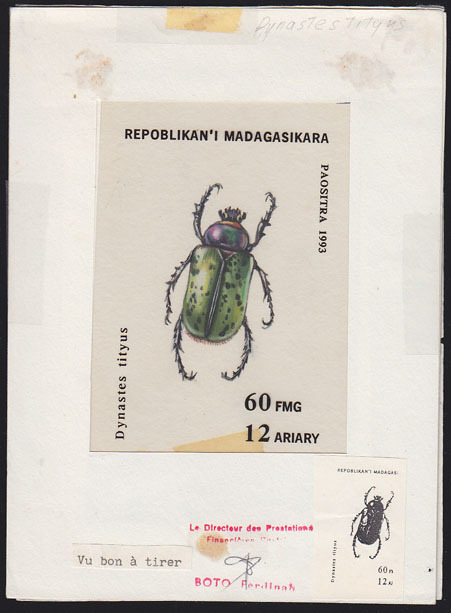 1544 MAQ MADAGASCAR (1994) Goliath beetle (Goliathus goliatus)*. Original artwork, watercolor on posterboard (20 x 17 cm) with acetate overlay for lettering. Approval signature of Director of Posts accompanied by monochrome proof of stamp. Design in window measures 13.5 x 10.5 cm. Scott No 1223, Yvert No BF90P. Unique!